My Name is Sarah: "Not Even the Sky is the Limit"
Just ordered it -- can't wait to get it! That is so cool! You guys are superstars! Thanks for sharing this book with us. Wendy and I loved meeting you and your Mom, Sarah!!!! Great blog! ordering for my daughter right now so she can read it to her kindergarten class! Thanks for sharing! This is really awesome, Sarah! I will definitely have to buy the book. What a great opportunity for you to be in the book, and to make so many new friends! Toby is cool, and brave, too, because I'm like you, I would not want to go jumping out of planes! I'm afraid of heights and won't even go all the way up a ladder! How awesome, Sarah! I think we'll need to get that book too. Thn I can show my little Cora your picture. 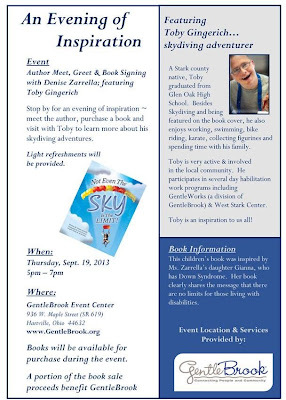 Thanks Sarah for posting the information about the Hartville Book Signing, we are so excited to host. We hope that you can come and visit with us that day! I just got my copy -- it is gorgeous! I love how it starts with babies and goes right up to adults. Maybe next time we are in Ohio you can autograph your page for us? Sarah, if you could be cured, would you? Yes,I would love to be cured of these darn allergies I have. My eyes are burning again today. So are my dads. What an awesome idea for a book! Maybe I will order it to keep for when I become a teacher eventually. Sarah, where are you? We miss you!!! !